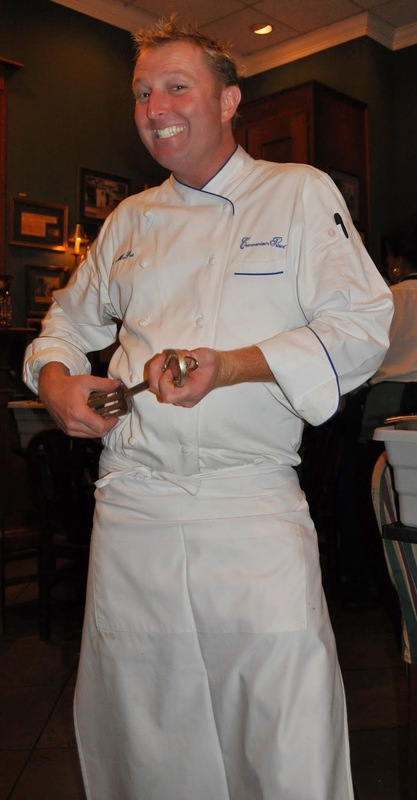 Chef Tory McPhail, executive chef of Commander's Palace in New Orleans, won the $25,000 prize on Food Network's Kitchen Inferno. We are breaking up with the Food Network. We are not breaking up with some of our favorite food gurus, just from the channel in general. It has been a slow separation, because we really loved Food Network. There was a time when we couldn't get enough of our favorite shows and there were many of them, Barefoot Contessa, Boy Meets Grill, Tyler's Ultimate... But, unfortunately, we've come to the conclusion that we have irreconcilable differences with Food Network. We've come to a parting of the ways and here are the reasons why. We liked the competitions. We loved The Next Food Network Star, Iron Chef and Dinner Impossible. But now everything is a competition and some of them are just sad. And those shows where they try to catch restaurant employees doing bad things just don't make us feel good. We don't like to watch shows that try to entertain us in unsavory ways. It is like watching Hoarders or Anna Nicole Smith's descent into addiction. We don't enjoy other people's misery even if they bring it on themselves. Additionally, many of the competition shows keep recycling the same old people over and over again. It's ok sometimes, but again...too much of the same, Food Network. We used to like Triple D. We are fans of Guy Fieri. How do you not like him? He's friendly, nice, energetic, but Food Network has ruined Triple D for us. How? Too much exposure. Triple D is no longer entertaining. It is just too much. As we said before, we were huge fans of The Next Food Network Star. After all, look what happened to Guy Fieri after he won. We cheered him on! He was a success story. That is why we watched, to see someone achieve their dream and get their own show. But then along Justin Warner. He won The Next Food Network Star competition and the promise of his own show on the Food Network. Sadly, Justin never got that show and we all ended up feeling a little gipped. And it wasn't because Justin was the one we were pulling for. It's just that he won fair and square and a promise is a promise. This is an extension of the Triple D problem, only it isn't just Triple D. Shows on Food Network are shown ad nauseum. We are tired of turning on the television to see Giada whip up Nonna Luna's savory broiled artichokes for the 500th time. Again, we like Giada, but enough is enough. We have discovered Create TV. It is more like Food Network used to be before the network executives quit seeing whisks and started seeing dollar signs. We love Cook's Country from America's Test Kitchen. You can really learn something from that show, like the best way to get that crispy brown crust on your salmon without overcooking the fish or a really great knife to add to your collection (http://threefriendsandafork.blogspot.com/2014/12/how-do-you-cut-it.html). Everything on Create TV is more real, none of the glitz and glitter and used car salesman pushiness of Food Network. We can feel our blood pressure going down when we switch the channel from Food Network to Create TV. Does this mean we will never again tune in to another competition show on Food Network? No! We were right there glued to the television when our favorite chef, Tory McPhail, beat Iron Chef Geoffery Zakarian to win the $25,000 prize on Kitchen Inferno. But what it does mean is we will be tuning in much less often and it's probably going to take something (or somebody) really special to get us to flip the channel back to Food Network.